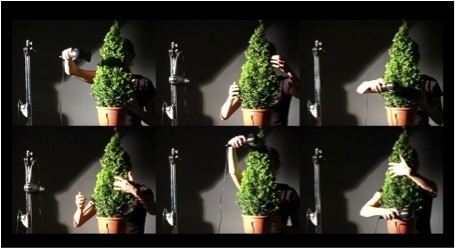 8. groene ruis (2007) for a small tree, gestures and contact microphones. A choreography of hand and arm movements controls the sounds with the help of contact microphones attached to the tree and live electronics programmed in MaxMSP. In this performance I use the sound of a tree and hairdryer not only as direct musical material but also for triggering soundfiles and synthesised sounds, programmed in Max-MSP. The piece is a combination of directly amplified sounds (tree and hairdryer), pre-recorded soundfiles, and live-processed electronic sounds, all triggered by the performer with the use of contact microphones. A choreography of hand and arm movements controls the sounds. Many of the movements relate to everyday gestures usually done, for example, with a hairdryer. During the performance of groene ruis, I look for the musical instrument in a small tree. I play the box tree with gestures, similar to movements used for playing a traditional musical instrument, namely the harp. I pluck its branches as if they were harp-strings. Every pluck on the tree is picked up by a contact microphone and causes an electronic “ploing” sound (in fact, an enveloped sine wave) and for this reason, the gestures of the performer seem to have transformed the tree into a musical instrument. After a while, though, the ploings break away, and the amplified sound of the tree itself becomes audible. The illusion of the tree being a musical instrument collapses. Now, the tree sounds like what it looks like. Whilst in the beginning, it was my movements of playing an instrument which seemed to cause the sound, now it is the materiality of the tree itself, which seem to cause the sound. In this piece, the perspective on musical performance changes: the first part concentrates on the activity of performing gestures; the second part, on the object which receives these movements. This change of perspective would not make any difference in the case of non-electroacoustical music, since their relationships would have been compulsory. As for this example, plucking a tree in a certain manner without electronics involved would have had only one possible sonic result. Due to the use of electroacoustical and electronic aids, though, the sounding result is no longer not dependent on either the movements of the performer or the material itself and for this reason, plucking the tree in a certain manner can produce myriad sonic results. Both the electronic ploings and the amplified sound of the tree are caused by two contact microphones, attached to the small tree. The tree functions as the membrane for these contact microphones. My movements cause the tree to vibrate. These vibrations are barely audible, but clearly perceptible for the contact microphones. The microphones transduce the vibrations into electricity, and from that moment onwards, the relationship between the movements of the performer and the sound can be composed. During the first part, the vibrations of the tree picked up by the contact microphones are used by the computer to trigger the ploing sounds. During the second part, these vibrations are sent directly through the loudspeakers and therefore the amplified vibrations of the tree are heard. Later in the performance, the hair dryer is added. There are, again, several situations: first, the tree is hair dried in a way familiar to everyday life. The sound of the hairdryer is processed, though, and starts to take on a sound identity, which no longer reminds us of the everyday object. The hairdryer is moved in different ways: sometimes in a realistic way, as if drying hairs, or in this case, the tree. During other parts of the performance, the movements done with the hair dryer are highly stylised and abstract, in a controlled way, as if, again, an instrument is being played. The performance switches between actions that are perceived to be musical actions and actions that are more closely related to everyday life. This piece adds more possibilities to the gestural identity shifts I describe in chapter 5, whilst analysing Windy Gong by Ute Wassermann and the snare drum pieces by Wolfgang Heiniger. During this “sounding tree” performance, the supporting approach (the amplified tree) is confronted with the generating approach (the “ploings”). Groene ruis [Dutch for “green noise”] is supposedly the background noise of the world. Green noise is also used to describe the overwhelming amounts of information about how to be “green” or more environmentally friendly.